A community celebration of caring and giving is planned when SUU’s Department of Theatre Arts & Dance presents a holiday Festival of Trees. This family event runs from November 30 through December 2, 2017 in the lobby of the Randall L. Jones Theatre. Hours for viewing are 3 p.m. until 8 p.m. on November 30 – December 1 and 9 a.m. until 8 p.m. on December 2. While donations of canned goods are requested to be brought to the theatre to benefit Iron County Care and Share, all events are free and open to the public. The Festival of Trees is not only a community event to celebrate the season, but also a way to raise funds for Iron County Care and Share. 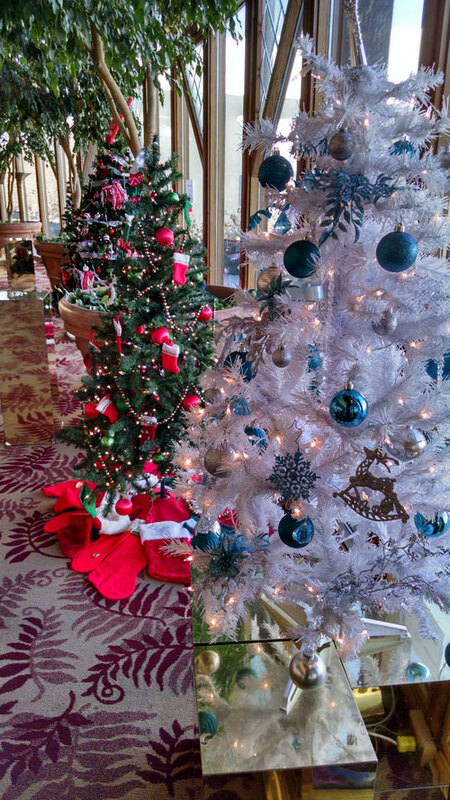 All trees on display have been decorated and provided by local businesses and individuals. These trees are donated to the festival and will be sold through silent auction, with all proceeds being donated to Iron County Care and Share. To add to the festivities once again the balcony of the Randall L. Jones Theatre will be decorated with the Utah Shakespeare Festival’s Christmas Village, which is sure a sight to behold. Saturday, December 2 will truly be a family orientated day at the Festival. Starting at 9:30 a.m. there will be readings of Christmas stories as well as a coloring station for children. Santa will join the festival from about 10 a.m. until 1 p.m. and be in the lobby for children and families to visit. During all open house times, there will be a place for visitors to bid on trees. Winning bids will be announced on December 2 and trees delivered soon after. In support of the Festival of Trees, with a donation of a can of food, the Department of Theatre Arts & Dance is offering a $2 discount on the price of admission to BENEATH THE SURFACE: An Original Choreographed Dance Concert.